GODIVA, the company known for its luxurious high-end chocolate products, has released a new white chocolate matcha flavoured version of its Tablet chocolate bar which is now available at 7-Eleven convenience stores in Japan in limited quantities. These Tablet bars are made from carefully selected ingredients by GODIVA’s chocolatiers. They are formed into an elegant zig-zag shape that fits satisfyingly into the palm of your hands. These bars originally went on sale in Japan in limited batches last year in December. They have now returned with this new flavour as well as the original milk chocolate praline flavour. The new white chocolate bar contains a ganache made from matcha sourced in Uji, Kyoto. 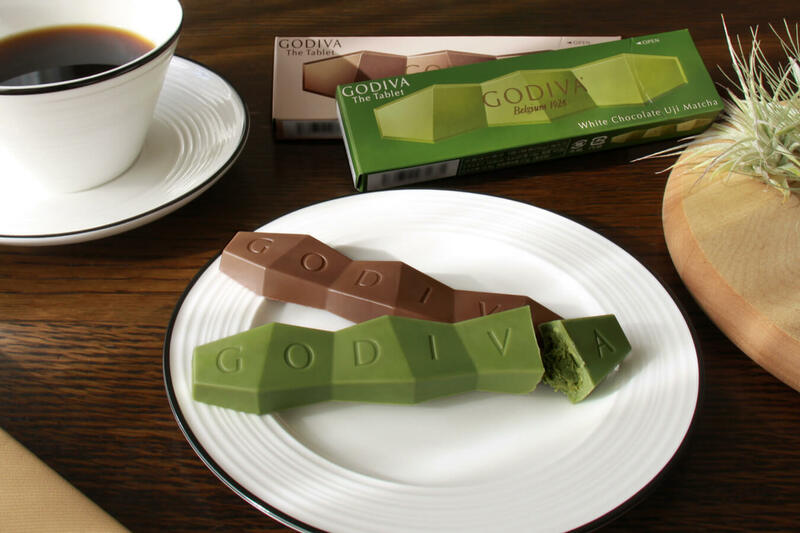 The combination of the rich flavour of the Uji matcha along with the Belgian white chocolate reinforces GODIVA’s quest for sophisticated chocolate production. The chocolate and packaging designs were designed by up-and-coming Spanish designer Victor Carrasco. Be on the lookout at 7-Eleven stores in Japan for this tasty treat. White Chocolate Uji Matcha: Approximately 17,500 branches of 7-Eleven (as of December 2018) in Japan excluding Hokkaido and Kyushu. *Select stores not stocking these products.